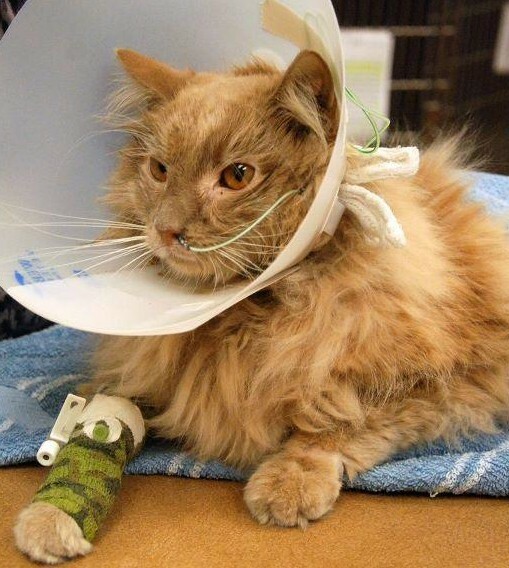 Jack The Cat is improving, though still in serious condition. He shared a hush hush visit with his petmom this weekend. Now that Karen Pascoe is headed back home, Jack The Cat is Lost in AA Baggage Facebook page reports tonight that she spent the weekend visiting with her beloved ca, Jack. The visit was kept hush hush to avoid a media circus at the veterinary hospital, showing that Karen’s first priority is her boy and his health. Jack has some very serious health issues as a result of his two months spent largely without food while lost at the American Airlines section of JFK airport. Jack was discovered when he fell through ceiling tiles in the AA customs room five days ago. We are not sure how long he may have been in between floors and whether he was trapped there. What we do know is that Jack was malnourished to the point where he was in serious danger from complications. There have been reports in recent days giving his condition as anywhere between serious, critical, and on death’s door. The Facebook page run by his family acknowledged very serious concerns but has been optimistic about a recovery. Our last post on Jack, on Thursday, 10/27, reported that he had undergone surgery for a leg wound and come out of that in good shape. By Friday he was reported to be stable and doing a bit better than the day before. A blood transfusion brought his red blood cell count up. The good news from Saturday is that Jack stood up on his own for a short time; another encouraging sign. Onward and upward … we hope, to a great recovery for Jack. What Scares Cats on Halloween? I hope that Jack gets to sit in 1st class and is fed is airline meal in a cyrstal gobblet. FYI my 15 pound cat flew with me under my seat on Delta (ASA). HOW HEAVY WAS JACK? It would be nice if, in a situation like that, they would allow her to pay extra and have the extra carrier placed under a seat mate’s seat if they don’t mind. Could even give the seat mate a small discount. I’d let someone put their pet’s carrier under my seat if needed, no problem. Is appears that Mona is referring to the Jack The Cat … Facebook page. she can correct me if I am wrong and she gets the comment update. Editor, yes that is exactly the Facebook page I am referencing. Sorry I did not make that clear..
It’s so great that Jack and his owner got to meet, for with Jack seeing her and receiving love, rubs, and hugs from her will surely help in his healing process. Praying for Jacks full recovery and safe trip back home. That is so true. Animals bond just as we bond. The fact that she was able to spend time with him and he with her, is very important…Animals just shut down when scared and alone. Thank heaven for this vet, have heard very good things about her. Praying also for quick and full recovery and safe trip home…. Unfortunately, when flying international, the only option is to send pets as freight. My mother moved in with us and traveled from Uruguay, South America by AA. She could not bear to leave her cat behind. She had to ship her out a couple of days before she traveled. We were worried sick the whole time. Chili had to be re-routed due to temperatures at various stops. There are restrictions for their safety, where temps cannot be under or over a certain number. They cannot be sedated, again for their safety, and they’re supposed to be fed and watered. Happy to say that she was no worse for the wear. Had we had the option, she would have traveled with mom in the passenger cabin. The cost was higher than mom’s fare, not like it was cheaper. Hope Jack makes a full and complete recovery! Good that all turned out OK. Worried sick is what I would be, as well.. I think for those traveling across the oceans and are concerned as I would be, check into ships rather than flying. There are transatlantic ships with accomodations for pets. Some are quite nice. If I knew I had to relocate, I would save up for this option instead of flying. Hope Jack makes a full recovery and AA should send you both 1st class with Jack sitting in a seat of his own. It is a long drive to Cali and especially this time a year. All my well wishes are with you and JACK. A cat needs his person so badly after all trauma. So thrilled Karen was able to spend time with her baby after all. My heart is so touched, feel like crying. I know how it felt visiting my Busta when he was in the vet clinic. Holding him and loving him made all the difference. Was able to get him to eat for the first time off my fingers. He got better, came home. Big hugs to Karen and the class she’s amidst the chaos and heart hurts. Your sister Mary Beth (think it’s your sister) did a miraculous job in attracting so many of us. Bless you, Jack, Mary Beth, everyone here and all cats everwhere especiall BeeBop and Sylvester who are also lost. Say a prayer for them everyone. OOPS – late nite posts sound Martian at times. Meant to say: Big hugs to Karen and the class she’s shown amidst the chaos and heart hurts. Jack get well and home soon. I hope that you and your family will be together soon. As a FOJ (friend of Jack) from the start of the 2nd week of him going missing, I can tell you it was also his weight. The weight limit is 15lbs and both Jack and Barry were over that weight limit. So glad you are recovering and back Jack. I know your human mom is so please to have you back so please keep on recovering so you can go back home and be with your mom and other playment also. The airlines need to change their practises BIG TIME. Cats should not be escaping, no matter if the baggage carriers are sloppy and let them fall. The airlines should develop what I would suggest be called PET PODS wherein the animal’s own carrier will be slipped inside a Fort Knox style metal welded one-piece carrier with a gate that can withstand dropping from any height. On booking the pet’s flight, the measurement of the carrier it will arrive in must be supplied so that a Pet Pod of the correct measurements is ready. Upon surrender of the pet for loading, the carrier with pet will be immediately secured in the Pet Pod in the owner’s presence. I am sure there are a dozen companies that could design a foolproof pod. It is clear that when a cat escapes, it is a miracle to recover the pet alive, a miracle if their life will ever be the same. If airlines accept pets for travel, they must stop being so negligent. Pets that fly are obviously valued by their owners as integral family members. Even one life ruined is bad enough, but the airline pet incidents website is showing an alarming number of pet escape incidents. It is horrifying — and shameful because it’s so unnecessary. Poor little guy! He has been through hell! I am glad he is doing well. I heard this story on the news, back when he first got lost.